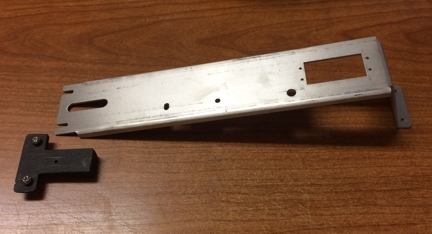 The CPM Aluminum radio board is CNC cut to provide a base system for integration with other options depending on the owner requirement and setup needs. The board has a standard servo cutout for the rudder servo and 4-40 hold down screws are taped into the board for easy servo Replacement at the pond. A 1/4" on/off switch hole and RMG mounting holes are already provided. The forward RMG Mount hole is elongated to allow proper winch drum alignment with the bow block. There are two slots for the forward cast hold down wedge that also serves as the base for the removable mast compression post. the rear of the board is held to the lead ballast with two Screws. This Board can be used alone or with the Jib Trim Servo Bracket, RMG winch Mount and Carbon Fiber Arrow Shaft system.